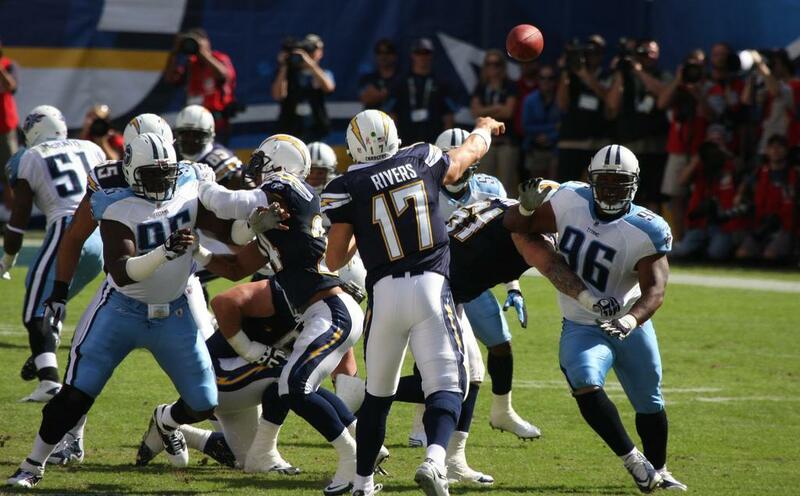 Philip Rivers is a standard setter when it comes to making throws in a tight pocket. Photo by Nathan Rupert. One of my first blog posts was Losing Your Football Innocence: 10 Things to Develop A More Critical Eye. It stresses the importance of studying NFL players and using them as a standard for evaluating college talent. Many of my peers who study games agree that while you’ll be hard pressed to find a college quarterback that performs just like an NFL veteran in his prime, it’s good to judge these prospects according to pro standards. What you’re seeking isn’t an exact match technique for technique. You’re looking for enough moments in games where the player shows enough skill and on-field smarts to execute at a basic level in a way that can be built upon with more coaching. This is the key point: you want players who show techniques than can be built upon rather than too many techniques that have to be broken down, eliminated, and then built back up. An accurate internal clock: A pro quarterback must have an internalized understanding that on most passing plays his pressure is going to break down within 2.9 seconds of the snap from center. At that point the ball either needs to be out of his hand or he’s moving to an open area of the field to release the ball. When a quarterback has a strong sense of timing paired good peripheral vision to sense pressure, he will make fewer mistakes than his peers even when he has to break the 2.9-Second Rule just long enough to successfully execute a play. Sensing pressure: This skill requires good peripheral vision as well as a feel for opposing defenders, schemes, and his teammates. John Elway supposedly could hear the footsteps of defenders coming around the blindside. He also said that he could frequently read the shadows of defenders behind him. Internal clock & sensing pressure – Peyton Manning: One the least athletic quarterbacks in this game, Manning possesses one of the most accurate internal clocks in the NFL. And because his timing is so good, his career sack rate is very low. Manning understands that in most situations it is better to throw the ball away than to try to create during the latter stages of a pass play (after 2.9 seconds). His preparation and diagnostic skills at the line of scrimmage are so good that he is rarely blindsided or caught unprepared. And if a teammate misses an assignment Manning often drops to the ground before he takes a huge hit. Even on the rare instance where he breaks the pocket Manning’s almost always seems a half a beat ahead of his opposition and this buys him an extra step to elude a defender and get rid of the football. Comfort in tight quarters: Quarterbacks have to be able to make accurate throws and poised decisions while surrounded by big bodies in the trenches. They have to be able to stand tall in the pocket and deliver the ball with pressure in their face or reaching for them from either side. And they have to be willing to take a hit to complete a pass. Maneuverability in tight quarters: This is perhaps the most important skill that separates a good prospect from a good pro. Don’t mistake this skill with mobility. I’m tired of reading about mobile quarterbacks. Mike Vick is the most mobile quarterback in the history of the game. However, he was also one of the least maneuverable while starting for Atlanta. Until he learned how to maintain a good throwing posture while keeping his eyes down field as he stepped away from pressure, he was not an effective pocket passer. Quarterbacks must know how to “climb the pocket” and “slide away from pressure.” Climbing the pocket involves stepping forward as the pressure approaches from the outside – even if the defender’s approach is so tight from the outside that it’s nearly in front of the passer. Sliding away from pressure is making a controlled lateral movement away from pressure. Both skills require good enough form and just a small change of direction so the time bought leads to a quick and accurate throw. Comfort in tight quarters – Tom Brady & Ben Roethlisberger: The Patriots offensive general is extremely good at standing tall in the pocket and following through with his reads and delivery not only in the face of a pass rusher, but also in a tight pocket. Ben Roethlisberger also possesses this skill, which somewhat compensates for his undisciplined internal clock. Although the Steelers quarterback has averaged close to 50 sacks per season in the last five years because he holds onto the ball longer than any passer in the NFL, his team encourages his tendency to hold onto the football and buy time. This is rare. So rare, I think about the Raiders of the `70s and the characterization of Ken Stabler standing like a statue in the pocket after his frequent seven-step drops that pushed his great offensive line to the limit. Fortunately Roethlisberger’s size, athleticism, arm strength, and improvisational skills have allowed him to take a beating and still deliver some of the more clutch performances in the history of the game. However, once his body reaches the breaking point his career could fall apart quickly(think Steve McNair). Maneuverability in tight quarters – Tom Brady, Peyton Manning, & Philip Rivers: All three quarterbacks possess the footwork and form to make a slight adjustment away from pressure and deliver the ball down field. As much as a good, young quarterback like Matt Ryan is comfortable taking a hit to deliver the ball in a big moment, he has a tendency to drop his eyes and turn away from the line of scrimmage when he needs to move away from pressure. This is one of the skills that he must acquire to become an elite passer in the NFL. Brady, Manning, and Rivers – especially Brady – can make one step away from a defender have more of an impact than if he sprinted 15 yards with the quickness of Mike Vick. Great article. Nice to see almost a checklist of sorts to use when evaluating QB’s pocket presence. This is great stuff! Are there any types of non-football field activities that QB’s can do to try and help increase any and or all of these areas? I’m not a coach so coaching techniques are out of my realm. However as an observer, there is a lot to say about drills that simulate pressure and practicing how to climb the pocket and keep one’s eyes down field. Ultimately it comes down to a ton of hard work and assimilating the physical skills and drilled reactions with the mental acumen of the game so you can react in tough conditions. Think about self-defense. It’s easy to say how you’d react when a guy twice your size with a knife is walking towards you asking for your wallet and it’s another thing to know how to physical defend yourself. All of that split-second timing and reacting comes down to hours of practice.